JACKSONVILLE – It was a hard fought, heavily rocked home opener for the Jacksonville Sharks who opened their 10th year as a franchise with a crowd drawing KISS night which featured a lights out halftime performance by KISS America in tribute of one of America’s greatest rock bands KISS. The show tonight started off great for Jacksonville as they kicked off with an electrifying first drive which debut quarterback Jonathan Bane and wide receiver Jarmon Fortson as both Sharks connected on a 12 yard touchdown pass to open the night. The first half remained a close battle as teams entered the locker room 30-21 game in favor of New York. 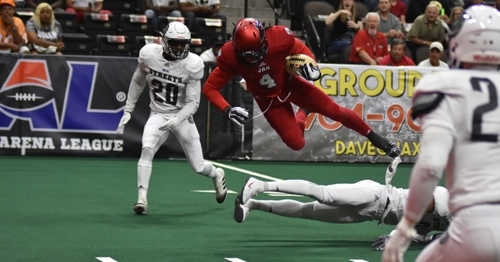 In the second half the first-year team sparked a scoring streak against Jacksonville and the Sharks ran out of time to close the gap with a 41-52 loss to New York, who celebrates their first win in team history, as they entered the NAL last year and have begun their inaugural season. Quarterback Jonathan Bane made his first start with the Sharks tonight where he debuted his gunslinger playing style to Sharks nation connecting with receivers Devin Wilson 11 times for 142 yards, Jarmon Fortson five times for 39 yards each of these players landed a touchdown. Fullback Alstevis “Squirrel” Squirewell rushed three times for 13 yards and punched in a touchdown for the Sharks. On defense the Sharks were able to limit the Streets in the first half and overall made major plays to help launch a potential comeback as Jacksonville landed two sacks (Nick Woodman, Zach Brown), one interceptions by Robert Brown and one red zone fumble recovery by Markus Smith. The Sharks will now face a road trip to NAL rival the (0-1) Columbus Lions Friday, April 19 at 7pm at the Columbus Civic Center. Columbus fell to the Orlando Predators 40-42 in Orlando, FL tonight. To watch the Sharks faceoff against the Lions next Friday, watch fo to the National Arena League YouTube channel or visit jaxsharks.com & social media for link details.